Cleverscript is a conversational AI and Natural Language Understanding engine built by Existor. Natural Language Understanding (NLU) allows you to understand the meaning of a user input. It is used to parse text or speech into structured data. Cleverscript allows you to quickly and powerfully construct scripted conversations. Natural Language Understanding allows scripts to recognise all the various ways of saying “How are you?” – such as “What’s up?”, “How’s it going?”, “How’s your day?”, “What’s happening?” and so on – and give it a handful of scripted replies, such as – “I’m great thanks. Can I interest you in a holiday?”, or even have it construct the language of its replies. Cleverscript is “programmed” using any spreadsheet application.Within hours, you could have a simple automated website-helper, customer service agent, or in-game-personality. Cleverscript can be embedded in your website, Smartphone application or computer game, with no internet connection required. 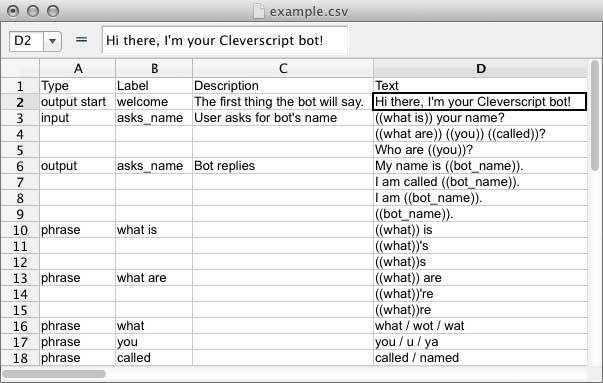 Cleverscript bots are created using spreadsheets. The basic idea is to write inputs (things that Cleverscript can recognise) and outputs (things that Cleverscript can say) on separate lines of the spreadsheet. But you don’t just write the actual words like “I want to go to Spain”. Instead you write “I ((want)) to go to ((country))” and later on in the spreadsheet, you write that ((want)) can be “want” or “really want” or “would like” or “wish to”, and ((country)) can be Spain or France or Greece or Canada or Thailand. Fuzziness, like typos and mis-spellings, are allowed too. So you can very quickly get Cleverscript to recognise hundreds or even millions of different things – all done via a spreadsheet. Example of the spreadsheet format used by Cleverscript. This bot comes from our manual, and can recognise and answer the question “what is your name?” in many different ways. For more advanced users, we allow for the setting and checking of variables. So, for example, it is possible to program a non-player-character for a game who responds in different ways depending on game state variables, or have a service agent remember all aspects of your enquiry until it is resolved. We have a step-by-step manual to guide you through the whole process. Cleverscript does not just recognise keywords. It considers the whole input. For Cleverscript, “I want to go to Spain”, “tell me about Spain” and “which airlines fly to Spain” can easily lead to different answers, and not just a generic page about Spain. The “I want to go” is just as important as the “Spain”. Cleverscript can pick this up, and can extend its understanding to even deeper levels. For example, if the user typed “wanna” instead of “want to”, Cleverscript could set a variable to remember that the user is being informal, and could respond in kind: “You’d love it, Spain is fantastic!” instead of “Spain is warm and wonderful”. Cleverscript can also use variables to remember context. In the context of a business trip, Cleverscript may give different answers than a family holiday. As above, once you have listed all the variations for “want”, you can use ((want)) in any sentence, such as “I ((want)) to fly on Tuesday”. Simply changing the word “want” to ((want)) quadruples the number of variations of that sentence that Cleverscript can recognise. That makes Cleverscript fast and efficient to work with. Cleverscript works with UTF-8 text. It has been developed and tested in English and Russian, using the Latin and Cyrillic alphabets. Cleverscript can help sell products – by answering questions about the product, and guiding the user through the ordering process, answering page-specific questions like “what do I now?” and “what’s the yellow box for?”. For web, smartphone or console, it will make non-player characters much more engaging and challenging. Cleverscript can power NPCs (non-player-characters) in games – on websites, in apps or even computer and console games. Most NPCs have a handful of scripted responses. Cleverscript NPCs could recognise and say hundreds or thousands of things. They can be setup as mini-puzzles within a game, so that only a specific question like “where is the Key of Doom” will elicit the needed answer. Your Cleverscript bot can include some small-talking ability borrowed from Cleverbot. It can have a basic chat (hello, how are you? and so on) all by itself without any scripting. We call this feature Clever Data. This is particularly useful for NPCs. Each NPC can have a separate personality (nice, mean, friendly, frightened) in their Cleverbot part, so that they can chat and whisper and flirt about whatever interests the user. But when specific questions are asked, Cleverscript takes over, and guides the user to the necessary information. In order to try Cleverscript, you will need to sign up for our API. The first month is free, so if it isn’t what you are looking for, you can cancel before the first payment is due. When you are ready to release your bot, we will generate an API key for you, so you can use our JSON API. It is also possible to run Cleverscript offline in a Smartphone app. For this we can provide a C++ library to be embedded in your application or game. Please contact us to discuss your requirements. Please see our pricing plans for production usage.